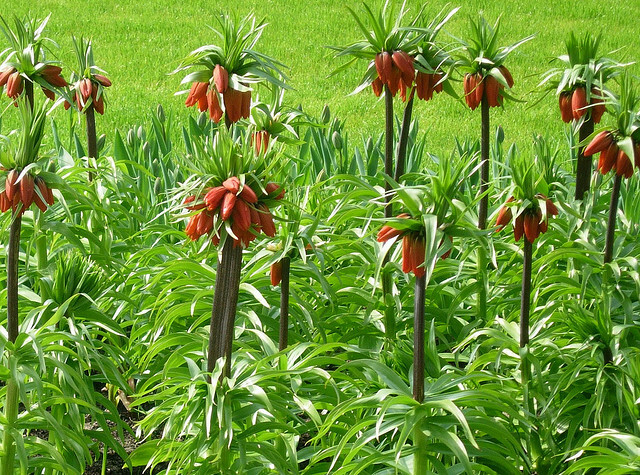 If you want some interesting accents in the springtime garden to combine with tulips and daffodils you should think about fritillaria. Frtilaria come in sizes to fit every garden. Some are very small, like Michailovskyi, at only a few inches high. Others such as Imperialis rocket to a height of 3 plus feet in the length of time it takes tulips to reach 12 inches. 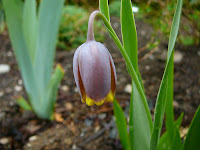 Fritillaria is a genus of about 100 species of plants in the family Liliaceae. Similar to lilies, they grow from bulbs composed of fleshy “scales” although the number of these scales is far less than those of lilies. They are native to temperate regions of the northern hemisphere through North America, Europe and Asia. 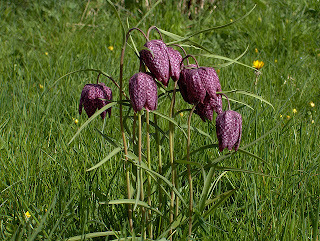 Fritillaria is derrived from the Latin “fritillus” which means “dice box.” It is commonly believed that this is due to the unusual checkerboard pattern that is present on the flowers of many of the species. The flowers of fritillaria are always striking. The majority of the species hail from the Mediterranean although they will do very well in Zone 5-6 if planted in a proper spot. 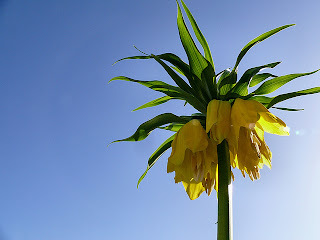 Because of the way the bulb is formed it is often suggested to plant them on their sides, as opposed to stalk side up. This allows for drainage around the bulb so water does not collect in the centre and cause rot. Fritillaria like well drained, humus rich soil in a sunny spot. Choose the spot carefully as many of the species resent relocation once established. Despite this fact it is recommended that they be dug and replanted every 4-6 years, as the bulb divide and can get overcrowded. 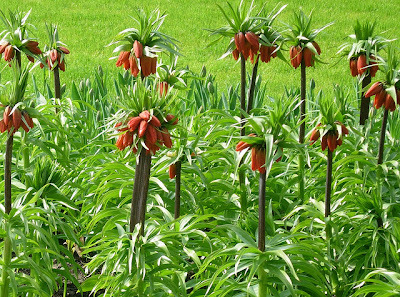 The two most common varieties are certainly fritillaria meleagris and fritillaria imperialis. 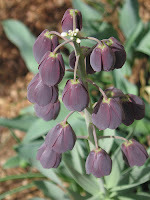 Meleagris is often called snake’s head or checkered lily. The head does resemble that of a snake ready to strike, and is covered in a checkered pattern. Meleagris is most usually purple, but can also be white. A variant of this fritillaria has yellow blooms. During Springtime weeding remember where you planted your Meleagris. They masquerade as “grass.” When they first appear the thin leaves and stem crawl along the ground and are easily mistaken and pulled out. As soon as the plants mature enough, they suddenly stand bolt upright and the blossoms quickly fill out and open. In all my years growing Meleagris I’ve caught very few in the transition from prostrate to upright. The exact opposite is true of Imperialis. As he name suggests, this is a very regal flower. Native to Iran, Turkey and Afghanistan it has been known in Western countries since the 1500s. This is a bulb for the back of your border in that it can grow to exceed 3 feet high. The large bulbs produce a strong stem atop which are borne a cluster of bells. The flowers, which can be red, yellow or orange, are topped with a celebratory tuft of green leaves. Some varieties have been bred to produce double tiers of flowers. Imperialis does not like to be wet so it is recommended to plant this bulb on its side as opposed to upright. But what about pests? 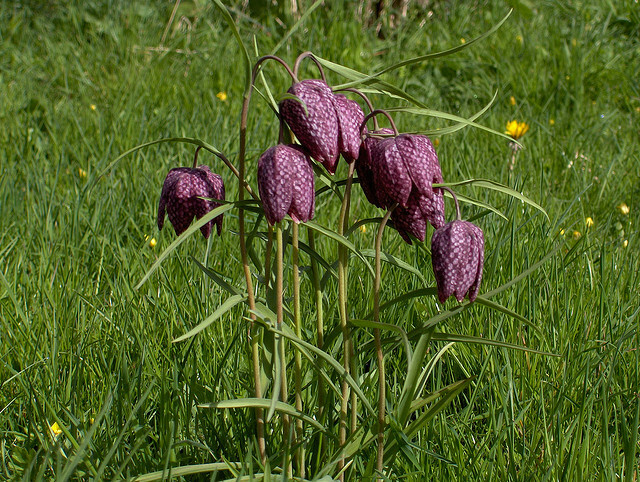 As is the case with most fritillaria, the leaves and bulbs have a bit of an unpleasant (skunky) odour that helps deter insects that might be dining on the other plants in your garden. Many varieties are available at garden centres in the Fall. They are planted at the same time as other Spring bulbs. If you can find a spot for these beautiful flowers where they’re happy, you will be rewarded year after year with beautiful blooms.